Following on from Thursday when we painted handprint caterpillars at Twins Club, today we got the paints out at home to create some more animals, flowers and general art work. I wanted each of the kids to have their own art space so I got the easel out for Thomas and Jasmine, and used the tuff spot for Ben. This was important because I wanted to see what the big two would do and they were keen to actually paint something, whereas Ben is still in the “paint everything one colour then smear round with hands” stage, and he usually does this all over their work. I set out the paints and a selection of brushes, sponges and old toothbrushes to paint with. The kids loved the idea of painting with toothbrushes and a lot of the first paintings were done using these. Ben had a wonderful time with the orange and black paint and some toothbrushes! Thomas painted a sunflower growing in a garden and Jasmine painted some flowers and a person. Once they had all filled one piece of paper I mentioned painting with their hands. Ben got stuck right in and was soon covered in black paint! 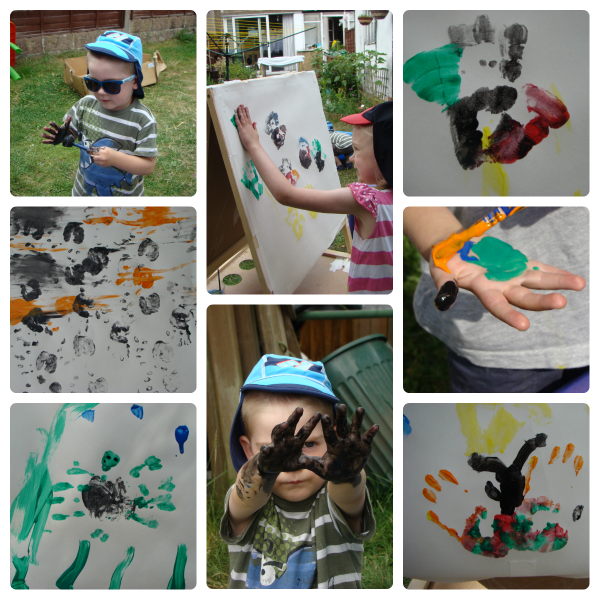 He did lots of handprints in different colours. Thomas added a handprint spider to his sunflower painting and then painted more bugs on a new sheet. I showed him how to paint a handprint butterfly and he also did some worms and another spider. Jasmine created lots of multicoloured hand-angels and she did her own butterfly, which I was very impressed with as she did it with no help from me. When they started painting with their hands I had filled the sandpit lid with water so the could rinse the paint off when they wanted to use different colours. Both boys, but especially Ben, had just as much fun washing their hands as they did painting! Finally, for their last painting of the day I added shaving foam as an option. I gave them all a tupperware container with some in and showed them how to mix some paint into it. None of the kids have ever been keen on using shaving foam in their messy play so I was interested to see how they would work with it. Having already had paint on their hands I was hoping this would encourage them to get the foam on their hands as well. They all started off using the brushes and sponges to paint it on to the paper but Ben soon got his hands involved and was happily hand printing with the foamy painty mixture. This encouraged Thomas and he joined in, creating some wonderful “fireworks” on his paper. Then, just as I was getting the boys clean and starting to tidy bits away, I turned round and Jasmine had covered her hands in the shaving foamy paint as well! 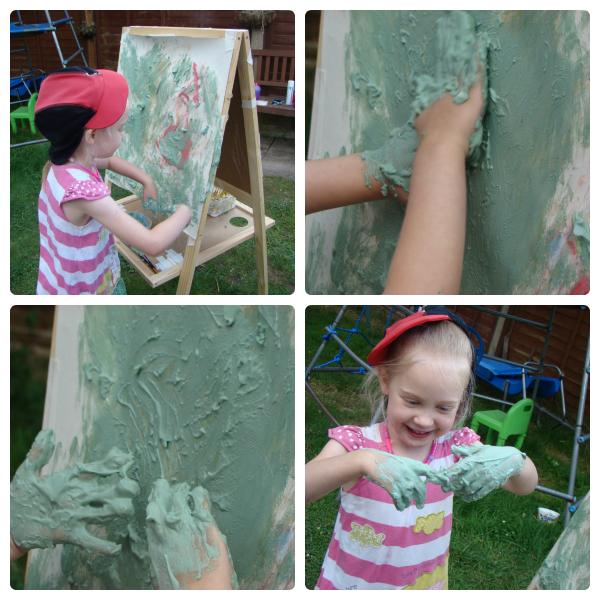 This is a big thing for Jasmine and she always takes a long time to come round to getting her hands really messy (which is strange because she is quite happy to play in mud all day!) All in all, we had a very successful painting session today. Now, I just need to find somewhere to display all the pictures! Future picasso’s I think! So much you can do with paints and they always seem to love it. Great that you can take it outdoors! I have never tried shaving foam yet and might give that a go. 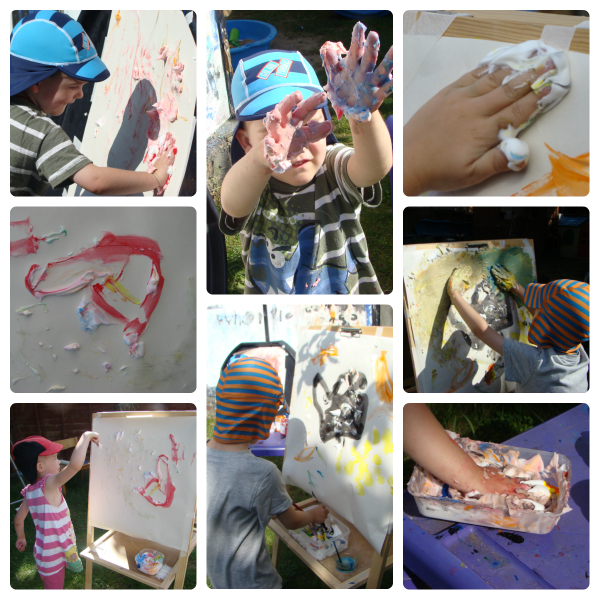 What fun to have shaving foam to paint with, I can see they were very creative and enjoyed their painting time. Thanks for sharing your great ideas with Country Kids. Like the idea of painting with shaving foam. N’s the same – really not keen on getting involved with his hands. Great work! In our recent art camp experience, we had a ton of materials for our campers to try out as fingerpaints; most children were entirely immersed in their work. It’s the novelty of trying interesting and unusual media to achieve similar or new effects as compared to traditional paints.